These math printables are great for test prep, RTI intervention, differentiation, assessment, morning work, center work, homework and independent practice. 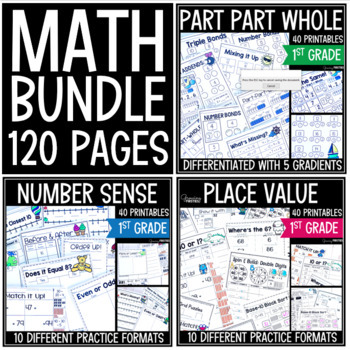 Each pack includes 40 printables with multiple practice options in a variety of formats. This series is a companion pack to my Common Core Crunch packs, based on requests to offer additional, independent skills practice without the seasonal/monthly appearance. Created for first grade, but can be used as enrichment for kgn or reteaching for second grade. Copyright © Growing Firsties. All rights reserved by author. This product is to be used by the original downloader only. Copying for more than one teacher, classroom, department, school, or school system is prohibited. This product may not be distributed or displayed digitally for public view. Failure to comply is a copyright infringement and a violation of the Digital Millennium Copyright Act (DMCA). Clipart and elements found in this PDF are copyrighted and cannot be extracted and used outside of this file without permission or license. Intended for classroom and personal use ONLY.